Founded by entrepreneurs, TestPrepHQ makes it easier for students to prepare, choose between and do well on standardized tests. By giving reviews on the best SAT prep courses, the best watches for nurses, the best MCAT prep courses and the best GMAT prep courses and writing articles on different tips for standardized tests, we provide value to our readers. Since the beginning we have believed that our entrepreneurial spirit has helped us drive our company to where it is today. Today our commitment to help those with entrepreneurial spirit is greater than ever. That is why we are proud to introduce the TestPrepHQ Entrepreneur Scholarship. This scholarship was created to help future entrepreneurs afford the cost of getting a college degree of their choosing and to help them along the path to entrepreneurship. TestPrepHQ will award one (1) $2,500 scholarship for the best submitted essay as determined by our judges. The scholarship award will be awarded in check format, made payable directly to the university or college where the winner attends or will attend, or directly to the winner. The scholarship is not renewable. Your future degree can be used for almost anything. Us at TestPrepHQ would like you to outline how entrepreneurship will play a roll on how you will utilize your degree. Anything from a solid business plan, to a side job is on the table for discussion. How will you use your degree to leverage new opportunities for yourself? How will your degree and entrepreneurship come together to help you to change your community and local area? How will you manage the increasing competition in a globalized world? These are only some of the questions you can answer for your prompt. Please keep your essay under 1,000 words. The deadline to submit your essay for the 2018 scholarship is October 15, 2018. Any current college or university student enrolled in a 2-year, 4-year or graduate program during the 2017-2018 school year is eligible. The student must be enrolled, and be able to provide proof of such, at an accredited university, college or trade school. The winner will be selected and announced on our site on or before October 31, 2018. The scholarship award will be sent to the winner by November 30, 2018. Send your essay in Word or .pdf format along with proof of enrollment to scholarship@testprephq.com. 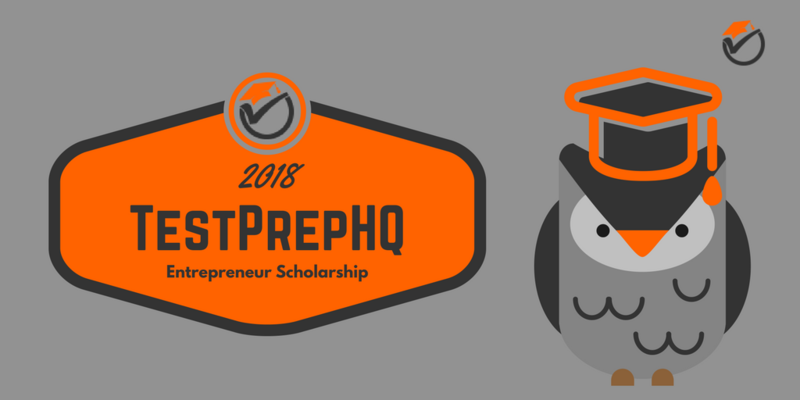 By submitting an entry to the 2018 TestPrepHQ Entrepreneur Scholarship, you transfer all rights and ownership of submitted content to TestPrepHQ, regardless of whether your entry is selected as a winner. TestPrepHQ reserves the right to publish submitted work at the conclusion of the entry period in any manner TestPrepHQ deems appropriate. Selection of winning submission is entirely at the discretion of TestPrepHQ. The winner will be contacted by TestPrepHQ via the email address used for submission. The winner will be confirmed ONLY after providing proof of enrollment in the form of a copy of a tuition bill, a picture of a current student ID, official or unofficial transcripts, or letter of proof from the accredited college, university, or trade school at which the winner is enrolled. Upon confirmation of enrollment, the winner will be publicly announced on TestPrepHQ.com, and TestPrepHQ will mail a check to the university, college or student on behalf of the winner. In the event a winner cannot prove enrollment at a college, university, or trade school, a secondary winner will be chosen. TestPrepHQ will never ask for a fee or admission payment. TestPrepHQ will never ask for credit card information or social security/FAFSA numbers. We only ask for the required information stated above. TestPrepHQ will never require a disbursement or redemption fee to claim scholarship winnings. TestPrepHQ offers no guarantee for winning of prizes or scholarship money. If a company or institution requires or does any of the above, the opportunity is most likely a scam. Make sure to report the institution to your local student services office. It is 7 in the morning on a warm morning in July and I have already showered and gotten ready for the day. I know that most of my fellow students are likely sleeping in and enjoying their school break over summer, but I am not jealous. I am anxious to start the day on a business that I have had since I was a kid, mowing lawns. When I was a kid, it was only me mowing the neighborhood lawns, but now I have a couple of employees and have moved on to other areas of the city. Since our founding, TestPrepHQ has been making it easier for students to achieve their goals. As part of our commitment to helping students and young professionals, we created a scholarship program to help them with rising tuition costs. That is why we are proud to offer the 2017 TestPrepHQ Entrepreneur Scholarship to Joseph Christensen.